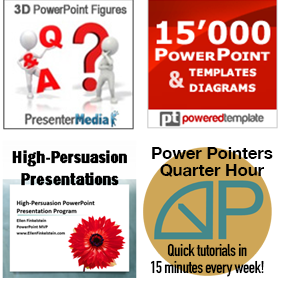 Do you think of yourself as a persuasive presenter? If you are a trainer or educator, perhaps not. If you present project updates, maybe not. If you present project updates, you should at least be trying to persuade your audience that you accomplished a lot and that what you accomplished matters. So every presentation has an element of persuasion. What makes a presentation persuasive? Be enthusiastic. Do you believe in what you’re saying? 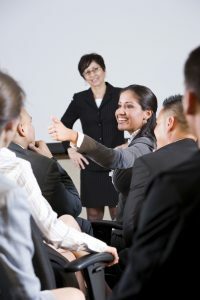 My course, High-Persuasion Presentation Program, goes deeply into the topic of speaking persuasively. It’s a good place to start. 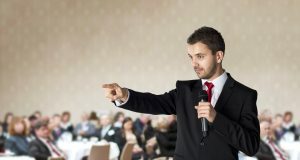 I also offer 1-on-1 coaching for persuasive presenters. What’s your top tip for presenting persuasively? Leave a comment and share your best tip for presenting persuasively. And please use the Share buttons to share this post with others who can benefit. You’re right that images are more persuasive than words, because they’re emotional. Yes, I agree that all presentations should have both informative and emotional elements. More persuasive presentations would rely more heavily on emotion, but should still be logical!